Corliss Lamont (1902 – 1995) was born into one of America’s wealthiest families. His Father was Thomas Lamont, partner and later chairman of J.P. Morgan & Co. He was educated at some of the most prestigious schools in America and England, Phillips Exeter Academy, Harvard, Oxford, and Columbia. Later he became one of the foremost apologists and philosophers of socialism during the twentieth century. The following article is reprinted from one of his better known books, “You Might Like Socialism”1 published in 1939. Like anyone else, I want to live well, and I want my wife and three children to live well. I believe in the wholehearted affirmation and enjoyment of life. There are surely few mortals who appreciate more than myself the simple material things that both sustain human existence and can bring to it such delight. I enjoy good food, comfortable living quarters and surroundings that are pleasant and healthful. I am very fond of sports, especially tennis, skating and swimming. I like to dance. And I enjoy, too, the pleasures of culture: the leisured reading of books and poetry, stimulating wit and conversation, evenings at theater and concert and motion picture, the opportunity to write. Some of my conservative upper-class friends occasionally banter me on the exuberant way in which I relish the sweets of existence, as if such relish showed that I could not really believe in Socialism. But they miss the point. For it is precisely the destiny of Socialism to bring to the whole community those felicities of living that up to now only a small minority have had the chance to enjoy. I want everyone to live well. And I am convinced that Socialist planning could quickly assure to every American family not merely economic security, but also a fair degree of comfort. For this reason, the idea of a Socialist society ought to attract profoundly not just the more poorly paid workers and farmers, but most of the middle class and many members of the upper class as well. Suppose the American people woke up some fine morning and read in the newspapers that every factory and farm in the country was operating at full blast, that all the millions of unemployed had been able to find jobs, that sweeping increases in wages would shortly go into effect and that for the first time in years federal, state and municipal governments saw the sure prospect of balancing their budgets. One can imagine the sense of relief, the happiness, the positive thrill that would be felt from one end of the country to the other; one can picture the rejoicing that would be called forth in every American home, in every place of business, in every public gathering. It would be like the end of the Great War (2); indeed, it would be the end of a Great War, the war on poverty, on unemployment, on depression and the thousand ills that accompany these major maladies of the capitalist system. All this I have been depicting is no mere word-mirage. It is a close approximation of what would actually take place under full-fledged Socialism. For Socialist planning means that the American economic system would in fact be kept going at 100 per cent capacity, that its potential plenty would at long last be released, its productive resources and distributive techniques utilized and developed to the maximum for the people and by the people. The almost immediate outcome would be that $5,000 (3) income for every American family that I mentioned earlier. And as time went on, this figure would steadily rise. These considerations spell out why Socialism means wealth, fabulous wealth, and eventually tenfold, yes a hundredfold, more wealth than Capitalism has ever been able to bring mankind. The fundamental principle that lies behind planning is fairly simple and one which we encounter in some form in many different realms of human behavior. It consists of coordinating our activities in the light of our capacities and of the objective external environment, especially its economic aspects. As individuals we all plan to some extent, whether it be for a day or a month, a year or a decade, always keeping a weather eye on the state of our finances. If we have a family, then planning becomes more complex and essential. The intelligent family looks into the future so far as is possible and plans, according to its resources, for the needs of its various members. If it is wise and has any sort of dependable income, it will make an annual budget, allocating definite sums to food, housing, clothing, recreation, baby carriages and the like. It will also probably try to set aside certain amounts as savings; and the most prudent heads of families will plan years and years ahead for the particular needs and vicissitudes of old age. Thoughtful people will take an even further step and, through the process of wills, lay careful plans for friends and family long after they are dead. Coming to purely economic units, we find that every kind of business concern, no matter what its size and nature, must plan. The larger and more complex it is, the more attention it has to pay to planning. Any big corporation, for instance, with its many different departments, must have central planning in order to coordinate its various activities and to function successfully as a business. This is true whether the U. S. Steel Corporation or General Motors is concerned, whether R. H. Macy and Company or American Telephone and Telegraph, whether Standard Oil of New York or the Pennsylvania Railroad. The planning necessary for the efficient management of huge businesses like these reaches out to all parts of America and in some degree abroad as well. And in certain fields where big business has come to be overwhelmingly predominant, the planning of a few large trusts or even of a single monopoly may extend over well-nigh a whole industry. The purpose of planning in all capitalist enterprise is, of course, to make money. And this means that each business, in the process of continually establishing and re-establishing its own superiority, must plan against its rivals and win away from them more and more customers, Trusts in the same industry have to plan against each other and also, in order to capture a larger and larger share of the general consumer’s income, against trusts in other industries. Thus, in enterprise both large and small, the plans of individual businesses and businessmen tend to cancel one another out to a considerable extent. The capitalist theory is that the most efficient and intelligently managed concerns come out on top. Undeniably this is frequently true; just as often, however, it is ruthlessness and lack of moral scruple that turns the trick, as has been amply illustrated in the lives of our “robber barons.” But whether efficiency or ruthlessness or perhaps both together are operative in any particular case, the result for the community is in the end economic. In order to mitigate or prevent the disastrous results of anarchic Capitalism in some important field, capitalist governments sometimes put into effect a species of planning for an entire industry. In most European countries the telephone and telegraph are publicly owned and operated, and in several the railways as well. Then, too, there are public planning schemes in existence over particular localities. A good example of this is the Tennessee Valley Authority (TVA), which is exploiting the power resources of the Tennessee basin on behalf of the population of the vicinity, much to the chagrin of the private utility companies. These types of piecemeal planning, however, no matter, how well they may work in the sectors allotted to them, cannot go far in solving the economic problems of a country as a whole. It is characteristic that the most far-reaching schemes of public planning under Capitalism should be for profit, or for profit and war. The so-called planning of the New Deal during President Roosevelt’s first term was directed, especially in agriculture, toward decreasing production in order to bring back profits by making goods scarcer and prices higher. While the Great Depression was still ravaging the United States, the NRA (National Recovery Administration) and the AAA (Agricultural Adjustment Administration) nobly cooperated, through planned destruction, with the usual haphazard destruction for profit by individual capitalists. Those were the days when almost over-night a fourth of the cotton crop was ploughed under, the wheat acreage reduced by 20 per cent and five million pigs destroyed. The AAA, doing its best under the circumstances to rescue the American farmer by boosting the price level, actually paid bonuses to all the producers who participated in this wholesale sacrifice to the capricious gods of capitalist economics. During the Great War, America, and more than half the nations of the earth as well, carried out planned destruction on an even larger scale. Not only did this war planning entail the shooting away into nothingness of billions and billions of dollars worth of goods in the form of munitions; even the food, clothing and other supplies for the military and naval forces were for the purpose of enabling millions of men to engage in the entirely unproductive function of fighting to the death millions of other men. In order to wage war more efficiently, the American Government proceeded to co-ordinate in some measure the economic life of the United States by setting up the War Industries Board, the War Trade Board, the Shipping Board, the Fuel Administration, the Food Administration and the Railroad Administration. Since the railroads under private management could not stand the added strain of war conditions, the Government took them over entirely and administered them on a unified basis. Unhappily, today again, the bulk of the planning that is going on in capitalist countries is for belligerent purposes. This is especially true of the Fascist Powers Germany, Italy and Japan in each of which the whole economy has for a number of years been on a war basis. As these Fascist states push farther and farther their present aggressions and prepare for new ones, they are forcing the democratic Capitalisms to introduce ever more extensive planning for the object of armed self-defense. This brief review of the limited planning that takes place under Capitalism shows how far removed it is in aim and scope from Socialist planning. Planning under Socialism is for use, not profit, for increasing production, not decreasing it, for peace, not war. And it demands as an absolute prerequisite the socialization of production and distribution. For as long as private capitalists retain possession of a country’s natural resources and transportation facilities, of factories, farms, banks and all the rest, they have the power to throw out of gear the best-laid of Plans. It is common knowledge that even with the minor public controls established under Roosevelt’s NRA, the American capitalists, long before the law was declared unconstitutional, constantly sabotaged, dodged and defied the Act. But Socialist planning puts a finish to that unending tug of war, so characteristic of Capitalism, between the Government, supposedly representing the public in general, and various business interests jockeying for control of it and determined to carry out whatever profit promising policies seem most advantageous. Under Socialism, politics and economics are thoroughly integrated. The socialization of economic activity which I have in mind, however, does not necessarily entail either nationalization by the federal government or ownership by state or city governments. Many industries, under Socialism the national government will certainly take over; many other economic concerns, less far-reaching in their ramifications, state or city governments will own and operate. But besides all this, there will be a broad sector of enterprise which is socialized yet not governmental. It will be advisable to run some industries through the instrumentality of Public Corporations, which will be subject to control by the government planning authorities, but largely independent in their administrative work. In the non-governmental class will also be collective farms and fisheries, and indeed almost the whole of agriculture; co-operative societies for production and distribution; and much of journalism, art and culture in general. This means that there will be a sizable number, running into several millions, of independent individuals not on the pay-roll of any governmental concern. These will include a large proportion of the handicrafts-men, farmers, fishermen, inventors, teachers, authors, journalists, actors, artists and intellectuals. They will make their living by working in such organizations as I have just mentioned; or by selling their products or services to such organizations, to public agencies or to other individuals. So, in the Socialist state there will be plenty of room for freelance workers of every type. Socialist planning differs from any sort of capitalist planning, lastly, in that it is not confined to special localities, industries or periods of time, but is continuous and nation-wide. A genuinely planned economy demands not only that all individual businesses in one industry, whether it be concerned with hats, shoes, sugar, coal or anything else, be consciously coordinated, but that each industry as a whole, including the prices of its products and the wages and working hours of its employees, be coordinated with every other industry as a whole. Think of the increase in efficiency and the decrease in waste that would result from planned coordination among America’s big energy-producing industries: coal, gas, oil and electric power. Such coordination, however, could reach its high point only when there was complete coordination also among the industries to be served. For only when we know how much energy is required throughout the whole country, and where and when, can we accurately gauge how much coal, how much gas, how much oil and how much electric power should be made available in a given period and in a particular locality. Again, it is obvious that there is so much overlapping in the field of transportation among railways, boats, buses, trucks and airplanes that the situation cries out for unified planning. But it is not possible to separate transportation from the things to be transported. A plan for coordinated transportation implies a plan for coal and steel, farm products and finished goods, just as a plan for all these things definitely implies a plan for transportation. And of course all of agriculture must be carefully correlated with all of manufacture. The flow of foodstuffs to the cities must be coordinated with the flow of manufactured goods from them. The needs, of the farmers must be estimated. Our steel plan, for example, must take into consideration the demand for tractors, combines and other agricultural machinery; and our agricultural plan the particular food requirements of the heavily laboring steel workers. Likewise there must be a well-worked-out plan for wholesale and retail trade, linking up these two main branches of distribution all along the line with industry, transportation and agriculture. The shops in town and city, the restaurants, the warehouses, the gasoline stations and other such distributive units all come into the planning picture here. Since the planning I envisage covers the entire socio-economic scene, it naturally extends into the fields of health and recreation, of education and culture. Socialism is particularly concerned to bountifully provide all the different activities and services in these realms with the necessary equipment and other economic prerequisites. The educational plan of the country, moreover, must be always closely interrelated with the economic plan, so that there may never be a lack of the needed technicians, scientists and other experts nor a deficiency of suitable employment opportunities for graduating students. Finally, the entire economic and cultural life of the country must be carefully correlated with finance under one vast, unitary budget that takes in all branches of industry and agriculture, of commerce and trade and extra-economic endeavor. This completes, in outline form, the picture of the great National Plan which Socialism sets in motion, a Plan which brings into the economic and social affairs of any country that adopts it a closely knit unity, a smoothly functioning team-work, among all the myriad enterprises and individuals involved, making each one count for infinitely more and lifting the collective achievement to new and unheard-of heights. Because of its controls over production and distribution, currency and capital investment, prices and wages and hours, Socialist planning is able to overcome totally and permanently the central capitalist difficulty of lack of purchasing power. As more and more goods come out of the factories, wages go up throughout the land or prices decrease or the working day grows shorter. To take care of the increased turnover in commodities, currency may, depending on its velocity of circulation, be expanded. Since there are no capitalists to appropriate a large proportion of the value which the people produce, the full instead of only the partial value of their labor returns to them in one form or another. Thus, the unceasing abundance of goods is matched by an unceasing abundance of purchasing power. And this results in that depression-defeating, prosperity-ensuring balance between production and consumption, supply and demand, which every orthodox economist and capitalist has fondly dreamed of seeing Capitalism itself attain. The United States and other capitalist nations are only as rich as the amount of goods that can be sold for a profit during any given period. But Socialist planning makes a country exactly as rich as its entire productive capacity during any period. This is why I say without hesitation that Socialism, in terms of sheer economic efficiency, is sure to far outstrip Capitalism. Since finance is the most important single element in Socialist planning and more crucial, if anything, than in a capitalist economy, a fact which ought to give some slight consolation to capitalist bankers, I want to discuss the subject in more detail. In a Socialist state the banking system operates under and administers an all-embracing Financial Plan for the nation as a whole. This Financial Plan is the counterpart of the Material Plan and translates all the production and distribution schedules of the latter into dollar units. The dollar is the common denominator in which the various aspects of the National Plan can be accurately expressed and clearly related to one another. The Financial Plan and the Material Plan are, in effect, two versions of the National Plan and each serves as a check on the other. The Government Treasury Department, together with the State Bank and its numerous branches, acts as a great central pool for the national income. This it does not only through taxation of Socialist business concerns and of individuals, but also through receiving a substantial share of whatever surpluses the different businesses, including those involved in foreign trade, succeed in accumulating. A considerable portion of such surpluses, however, are retained locally by the factory or other unit earning them and are used collectively for expansion, improvements or social benefits connected with the same enterprise. The Government also raises a certain amount of capital through savings banks and through the flotation of public loans, which continue to be necessary during the first stages of Socialism. The surpluses or “profits” which economic enterprises build up under Socialism have a very different status and play a very different role from what we have been accustomed to expect under Capitalism. They are, in fact, mainly a book-keeping device. Socialist business is run, as I have said, not for the sake of making profits, but in order to provide goods and services to the community. The most convenient process of accounting and of distribution, however, demands the mechanism of buying and selling, of money and prices. Furthermore, identifiable “profits” are necessary so that our Socialist planners can set aside a certain proportion of the nation’s income in order to meet depreciation and obsolescence and, above all, in order to expand the means of production. Soviet Russia, for instance, put into social savings for such purposes an annual average of one-third its total income during the first two Five-Year Plans, a feat which stands out all the more owing to the fact that capitalist economists have always argued that a Socialist government would act like a reckless spendthrift and could not possibly exercise the foresight and intelligence to accumulate capital. Whereas under Capitalism money and prices control the output of goods, under Socialism it is the output of goods that controls money and prices. Money is on a goods standard, not a gold standard. No real need exists for the latter unless to make the initial transition from Capitalism psychologically easier in the minds of the people. There can be no such thing as financial bankruptcy unless the supply of commodities proves inadequate; the value of the currency does not depend on any gold reserve, but on the quantity and quality of goods that nationwide planning has made available. Money ceases to be a commodity in itself, as under the capitalist system. It simply serves as the recognized unit of economic measurement and exchange, a function that some medium will have to perform in any future stage of society. The most obvious advantage of a Socialist financial system is that it enables the public authorities to distribute and re-distribute the nation’s capital resources according to the needs of the entire economy. The surpluses acquired in one sector of business can be transferred to other less developed and less lucrative branches of economic activity. This is analogous, on a national scale, to the various allocations within the huge budgets of some of the bigger capitalist corporations. Under Socialism a number of enterprises, particularly in the sphere of education and social services, will continue to show financial loss, perhaps permanently. And there will also be deficits in the industrial field, especially when some great new project is getting under way. in houses beneath even a minimum standard of decency. It would also be inconceivable for socialized capital to go into the production of things clearly harmful to health and well-being such as noxious drugs, patent medicines and deleterious foodstuffs for which there might be unintelligent and perverse demand. It would be impossible, too, for capital to create manufacturing plants and services that would be continually duplicating one another, ruining one another through cut-throat competition, spending huge fortunes in misleading advertising, and inundating a locality or even the entire country with a bewildering flow of practically identical goods. The huge sums of money and the very large personnel involved in speculative activities in commodities, in land, and in stocks and bonds would also become a thing of the past. And, alas for the gamblers of high finance, that symbol of Capitalism at its worst, the stock market would be no more. The perfect synchronization between savings and capital investment that Socialist planning makes possible is one of the weightiest arguments in its favor. Since the decision of how much and where and when to save and the decision of how much and where and when to invest rests in the hands of the Planning Commission and the Government, there is no danger that these important decisions will be at odds with each other as they so often are under Capitalism. The unplanned capitalist method means that two sets of different people, frequently with conflicting interests, save and invest as they see fit, with the result that the relations between saving and investment are always becoming maladjusted. Either savings cannot find an outlet in profitable investment or needed investment cannot find sufficient savings to put it across. In either case economic troubles are the outcome. fulfilling its program. If the bank discovers that the credit is being wasted or used inefficiently, it will at once stop further credits until the matter is cleared up, even instituting a special investigation if necessary. Thus, under Socialist planning, the banks become the watchdogs of the whole economy by carrying on what amounts to a constant audit of all business enterprises. They act as the vital link between the various sets of plans drawn up on paper and the fulfillment of these plans in terms of concrete goods and services. Their vigilance means that there can be no let-down on the part of either management or workers in a concern without the whole personnel being called to task. In this function the banks are aided by a system of accounting which penetrates into every nook and cranny of economic activity. Socialist accounting, organized on the strictest basis, aims to cut production costs and to attain the greatest possible results for the least possible expenditure. Book profits enter again into the picture here as a partial test of whether or not a plant is being operated efficiently. So the idea sometimes advanced that, under Socialism, extravagant executives will fling away heedlessly and without restraint the financial resources of the community is merely a caricature. Furthermore, besides the checks and balances inherent in the technical set-up of Socialist planning, there is always the control exercised by the people themselves through regular democratic procedures. At established intervals they can approve or disapprove of the planning schemes in effect or proposed by electing representatives and officials committed to carrying out the popular will. And at all times they can bring pressure to bear by criticisms and suggestions through public meetings, the organs of opinion, individual or organized lobbying, and other such processes of democracy. Of paramount importance in this connection will be the role of the trade unions, to which virtually all working persons will presumably belong. There is nothing, then, in the nature of Socialist planning which prevents it from being administered in a thoroughly democratic manner. One can easily imagine some of the big public issues which are almost certain to emerge in the natural course of collective economic planning. Since the standard of living under Socialism goes steadily up, the question will arise as to how the people can most benefit from the increasing wealth. Shall our planners put the emphasis on raising wages continually or on providing more and better free services like libraries, parks and public concerts? How much of the national income shall be saved for the purpose of new capital construction? And in this connection will the time come when the population will prefer to stabilize the standard of living at a certain point and concentrate on enjoying the consumers’ goods producible at that level rather than to continue with vast expansion programs? For under Socialist planning there is no categorical imperative, as under Capitalism, for an economy to keep on expanding indefinitely. This particular issue might well develop in relation to the matter of the average annual working time. In order that more leisure be secured, one political party might advocate reducing the work-day by a third or augmenting the number of holidays or cutting the age of retirement to fifty; another party might call for the maintenance of existing work-time schedules and for a mighty increase in production which would lift the standard of living to even greater heights. Or another burning issue might come to the fore, once the necessities of life had been provided for everyone, over whether to stress the provision of cultural as distinct from material goods and services. END NOTES: It is important to keep in mind that this was written in 1939 just before WWII. Some adjustments were made to the socialist agenda as a consequence of the War, however, the basic goals remain the same today. I chose this for our first article on the progressive mind because I have witnessed during my lifetime many parts of its agenda being proposed or actually put in place by progressive Presidents and unconstitutional bureaucracies. 1. Corliss Lamont, You Might Like Socialism (1939) Modern Age Books, New York. Impeachment May Be Our Only Hope! After three days of testimony before the Supreme Court on Obama’s health care law, the so-called “Affordable Health Care Act”, some things are becoming evident, although no one can predict how the Court will rule. In a “best case scenario”, it will rule the entire law unconstitutional, killing it completely. In a “worst case scenario”, they could rule the law constitutional as it stands, which would be catastrophic for the country. While either is possible, neither is probable. More than likely, the final ruling will fall somewhere in-between. There seems to be a widespread belief that the individual mandate will be struck down by the court, although that is in no way certain. Even if it is, there is a strong possibility that parts of the law will be left intact. Based on the history of Supreme Court decisions, it is likely that if the Affordable Care Act is struck down, all or in part, the majority opinion of the Court will contain language that can be used by the left to further expand the meaning of the commerce clause of the Constitution. At this point in the deliberations, it seems obvious that the final outcome and thus, the future of the Republic will hinge on the decision of a single Supreme Court Justice. It is certain that the four progressive/socialist Justices will come down on the side of government, while the four constitutionalists will elect to strike down, at least several parts of the law. The deciding vote on most of the major issues will certainly be Justice Anthony Kennedy. That means that the future of the Republic for generations to come depends on the decision made by one man. This cannot be allowed to stand. A free Republic must be governed by the rule of law. We cannot afford to continue to allow one individual to decide what that law shall be. 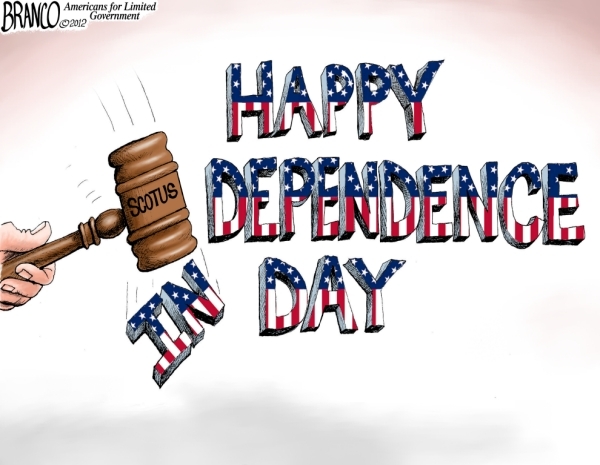 In order to maintain the independence of the Judiciary, federal judges, including Supreme Court Justices, are appointed for life, or “during good behavior”. This lifetime tenure was granted to the judiciary with the understanding that they could be turned out of office by impeachment, should they prove to be unworthy of the position. In the history of America, thirteen federal judges have been impeached. However, only one Supreme Court Justice. That was Associate Justice Samuel Chase in 1804. 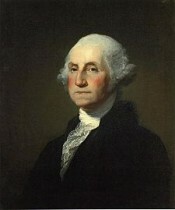 He was impeached by the House of Representatives, charged with allowing his partisanship to influence his Court decisions. He was acquitted in the Senate by one vote, however. Congress, after the elections of 1800, was dominated by the Democratic-Republican Party. However, because of the slow turnover of the Senate due to the three-election-cycle term of Senators, the Federalist Party was still strong enough in the Senate four years later to prevent Chase’s conviction. Since that time, no Supreme Court Justice has ever been impeached by the House. Short of impeachment, there is no way Supreme Court Justices can be held accountable for violating their oath of office. This fact became a major subject of debate during the Constitution’s ratification process. The anti-federalists feared that the Supreme Court would become too powerful, usurping the powers granted to the Legislature by the Constitution. Justices would hold their office for life and there were no provisions in the Constitution for correcting their errors. The Framers believed the threat of impeachment would by sufficient to prevent the Court from overstepping its authority. One of the Anti-federalists, writing under the pseudonym “Brutus”, succinctly stated the objection in an article dated March 20, 1788. “1st. There is no power above them that can correct their errors or control their decisions — the adjudications of this court are final and irreversible, for there is no court above them to which appeals can lie, either in error or on the merits. — In this respect it differs from the courts in England, for there the house of lords is the highest court, to whom appeals, in error, are carried from the highest of the courts of law. Alexander Hamilton attempted to answer the objections of the Anti-federalists in Federalist numbers 78 – 81. In Federalist 81, Hamilton summed up the objections of the Anti-federalists. Later in the same paper, Hamilton attempts to put this objection to rest by pointing out the power of impeachment given to the two houses of Congress. Conviction in impeachment cases requires a two-thirds affirmative vote in the Senate. This makes conviction almost impossible with the highly partisan nature of the professional politicians who populate both houses of Congress, a majority of whom will always side with their party over the welfare of the nation as a whole. We saw this in the planned impeachment of Richard Nixon and in full display during the impeachment of President Bill Clinton. The Act of impeachment will always be a partisan issue so long as the two major political parties are allowed to hold the power over government they have exercised from the beginning of the Republic. This fact of political life prevails in all political parties. The prosecuting party will ignore facts and mitigating circumstances in order to gain a victory over its opponent, and the defending party will do the same in defense of the accused in its party. 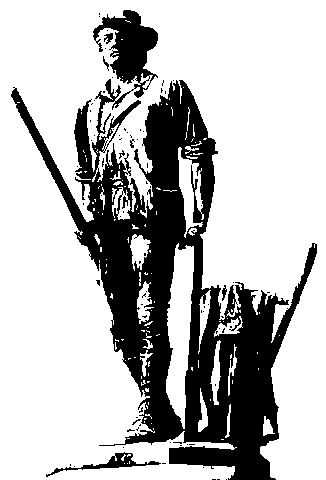 The next four to twelve years will be an all-out battle between the forces of despotism and the forces of liberty. There have been only two periods in the past when the nation has been as divided as it is today; during and after the Revolutionary War and the period surrounding the Civil War and its aftermath. We cannot allow the outcome of the coming conflict to depend on the decisions of one Supreme Court Justice. The Constitution is our only real defense against outright tyranny. By now, this should be apparent to anyone who honestly looks at the facts. Since the tenure of Chief Justice John Marshall in 1803, the Supreme Court has taken it upon itself to decide what the language penned by the Framers actually means. Our current Court is almost evenly divided between the enemies of the Constitution and its defenders. The four progressive/socialist Justices barley mount a pretense of honoring the Constitution they took an oath to defend. As difficult and distasteful as it is, impeachment seems to be the only means of changing the politically corrupted nature of the Supreme Court. We simply cannot wait for time and chance to do it for us, and the immediate future is likely to be the only time for generations when impeachment is possible. Thanks to the heavy-handed and tyrannical way in which Obama wields the powers of his office, millions of Americans are waking up to the realization that our nation is on the verge of total economic, political and cultural collapse. Every day hundreds if not thousands of citizens are gaining more knowledge of how our system works and why. Humanly speaking, the system established by the Founders, has alone been responsible for the success and prosperity we have enjoyed in the past. Before the nation goes back to sleep, either from the stupor brought about by socialist despotism or the indolent slumber fostered by the blessings of liberty, we must begin to take the steps correct the problems in our court system, from the federal trial courts to the Supreme Court. More information on the Supreme Court and Impeachment. In part one of “Who’s Defending the Constitution” we discussed numerous examples of attacks on the Constitution at all levels of government, the media, universities, etc… I received several more examples via e-mail and Facebook from readers of the post so now the question is, why the public disdain from so many of our “leaders” in the government, school and the media? We’ll discuss a theory regarding the constant barrage of attacks in a future post but for now, let’s go over why the constitution has become so easy for the left to knock around. Our Rights are unalienable and come from God. The purpose of civil government is to protect our God-given Rights. Civil government is legitimate only when it operates with our consent. And this segues straight into another reason why the Constitution is losing its’ prominence among our nation and the rest of the world. In the 1962 Engle vs. Vitale case and the 1963 Abington School District vs. Schempp cases, the Supreme Court ruled against school prayer and school sponsored religious activities. This essentially started the highway we’re on now, where every court case is ruled in such a way that it is freed from religion as opposed to the originally intended freedom of religion as stated in our founding documents. The result has been tragic. We are at the point now where we cannot express our religious freedoms on government properly for fear of a lawsuit from the minority of people who believe in no God whatsoever. So the foundational principals of our Constitutional Republic have been ripped out from under us. The Judeo-Christian values and the Ten Commandments. Without a firm understanding of these from the branches of governments that are supposed to protect them, the Constitution is just another “form of government document”. I strongly encourage anyone that is reading this post to understand and study our founding documents and the history surrounding them. One of the purposes of Christian Patriots USA is to have a firm understanding of these and encourage and teach them in every way we can. We believe it is just as critical that we are able to reach and teach our children so that have a proper understanding of what the roles of the government are and what their roles and responsibilities are to keep what our Founding Fathers had intended. The Obama government is the most lawless government in American History. When the fifty-five delegates to the Philadelphia Convention debated and crafted the U.S. Constitution their intention was to write the rules for the operation of the federal government. 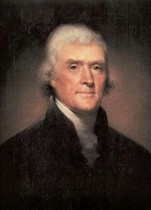 Their task was to preserve the principles of government identified in the Declaration of Independence, while at the same time, drawing up a plan that would provide the new government with the powers necessary for carrying out their legal functions and preserve the sovereignty of the participating states. A crucial goal of the Constitution was to limit the power and scope of the federal government and prevent it from encroaching on the legitimate powers of the states. Article VI of the Constitution established the Constitution as the “supreme law of the land”. More specifically, it established the Constitution as the supreme law governing the operations and scope of the federal government. Only to the extent that the government is in compliance with the Constitution can it make any claim to being a government “of laws and not of men”. The first ten Amendments to the Constitution were adopted to clarify portions of the Constitution and give emphasis to its limited powers. The limit on the powers of the federal government was given further emphasis in the Tenth Amendment. From the beginning, many power-hungry elected officials, tried to expand their powers beyond those granted. For the first hundred years Presidents and the Supreme Court were somewhat effective in defending the integrity of the Constitution. However, in the presidential elections of 1892 and 1896 conscious decisions were made by all the major political parties to begin testing the limits imposed by the Constitution. The most important proposed departures from the original plan was to allow the federal government to collect a graduated income tax, and elect Senators by popular vote rather than by appointment of the state legislators as the Constitution required. The sixteenth and seventeenth amendments ratified in 1913 during the “progressive era” opened the floodgates, allowing for the wholesale violation of the Constitution. The sixteenth Amendment allowed for a direct income tax on individuals, making it possible for socialists and progressives in government to engage in income redistribution through a graduated income tax. The Seventeenth Amendment shifts the election of Senators from the state legislatures to the general population of each state, effectively neutralizing the Tenth Amendment placing the real government power in the hands of political “bosses” of the Parties in power. Since that time the powers of the federal government and violations of the Constitution have increased exponentially to the point that it is questionable whether we are any longer a Constitutional Republic. Every administration since 1896 has violated the Constitution, both Democrats and Republicans. However, none have so blatantly refused to acknowledge the authority of the Constitution as Barack Obama, beginning with the first sentence of the first Article. This clause makes it clear that the Executive and Judicial Branches do not have the power to legislate or make laws. Yet, most of the laws enforced by the federal government today that infringe on our liberties originate in the Executive and Judicial Branches and not in the Legislature. The legitimate functions of the various departments in the Executive Branch are to implement the laws and policies established by the Legislative Branch. The Treasury Department, State Department, Interior Department, Justice Department, and Defense Departments exist under the “necessary and proper clause” of the enumerated powers section. Others are unconstitutional because they do not relate to the limited powers granted to the federal government by the Constitution. Today we have a plethora of Executive Branch bureaucracies, reminiscent of the old Soviet Union, making laws affecting every aspect of our personal and business life. These bureaucracies are headed by “Secretaries” who are illegally authorized by Congress to make laws at their discretion. This is a double violation of the Constitution; (1) Most are unconstitutional because their jurisdictions are not authorized by the Constitution; (2) Congress does not have the authority to delegate its legislative powers to another branch of government. President Obama has taken this egregious violation of the Constitution to a new height by appointing Czars over the various bureaucracies who answer directly to the President, and have the authority to “dictate” to the Secretaries and department officials the “rules” to be made and enforced by the full power of the federal government. Department Secretaries are confirmed by the Senate and are accountable to it. The Czars are appointed directly by the President and are not confirmed by or accountable to Congress. This situation cannot be allowed to continue if we are to maintain any fragment of our liberty in the future. It is the responsibility of the House of Representatives to cut funding for these unconstitutional departments until they are forced out of existence. This clause makes the Vice President the Chief Executive Officer of the Senate. The phrase, “but shall have no vote” has been interpreted by Senate Political Parties to turn the office of President of the Senate into a ceremonial position with no executive authority. Contrary to the belief of Vice President Biden, The Constitution places the office of Vice President in the Legislative Branch not the Executive; its position in the line of Presidential succession not withstanding. As a matter of fact, Presiding over the Senate is the only duty assigned to the Vice President by the Constitution. The office of Majority Leader, an unconstitutional office created by the Senate in 1921, has been allowed to usurp the authority of the Vice President with impunity for almost a hundred years. The Senate is the primary check on the Executive Branch of government. This departure from the Constitution upsets that balance of power in favor of the Executive Branch. There is no historical or Constitutional justification for the office of Majority Leader in its present form. This clause gives the House of Representatives the “power of the purse” since revenue can only be raised to fund the legitimate functions of government and all revenue bills must specify the purposes for which the revenue is to be allocated. Since budgets, revenue and allocations are inseparably linked, budgets are to originate in the House although the Senate may propose amendments. The President can make budget recommendations to Congress under Section 2 of the Constitution. The undisciplined and often unconstitutional methods of budgeting, allocating funds and raising revenue are a primary culprit in our present financial crisis. Congressional authority for taxing and spending is further explained in section eight, Article I. Here Congress is given the power to tax and spend for three specific purposes; pay debts, provide for the general welfare and common defense. This is followed by a list of sixteen specific items for which revenue may be raised and spent, clarifying the general phrases “general welfare” and “common defense”. One of the ways Party leaders ensure their choice of candidates for President and Vice President is to manipulate primary dates in violation of Article II of the Constitution. When we cast our votes in a primary election, we are actually voting for an Elector, and only indirectly for the candidate that Elector is pledged to support in the Electoral College. By manipulating the dates on which primaries are held, party leaders are able to influence the outcome through the power of suggestion, with support building for candidates who appear to have the most popular appeal. Article II, Section 1, clause 16, was included in the Constitution specifically to prevent prior voting by one state from influencing the votes in other states. This clause is a single compound sentence broken only by a semicolon. The rules of English indicates that the Framers intended for the “time of choosing the Electors” and the “day on which they shall give their votes” to be on the same day respectively. The primary system and the primary dates are the creation of Political Parties and not the Constitution. The current primary system often results in candidates being chosen that do not represent the real choice of the voters. Article3.2.9: In all Cases affecting Ambassadors, other public Ministers and Consuls, and those in which a State shall be Party, the Supreme Court shall have original Jurisdiction. This clause gives the Supreme Court original jurisdiction over cases in which a state is one of the parties involved. However, due to the number of cases involving states because of the federal government’s overstepping of its Constitution role, for efficiency, cases involving states are handled in the same way any other federal lawsuit is handled; they are first heard in district courts, then appealed to the appellate courts, and eventually to the Supreme Court. We currently have several cases involving states winding their way through the court system; involving immigration, Obama care, and several other matters. Meanwhile the Constitutional issues these cases relate to continue unabated. The Constitution does not give either Congress or the Supreme Court the authority delegate these cases to a lower court. One of the functions of the Executive Branch is to enforce the federal laws through the Justice Department. Article 2.3.4: [the President] shall take Care that the Laws be faithfully executed, and shall Commission all the Officers of the United States. The Obama Justice Department picks and chooses the laws it will enforce and ignores those the President disagrees with. The most obvious laws that Obama refuses to enforce are immigration laws. 4.4.2 And shall protect each of them against Invasion; and on Application of the Legislature, or of the Executive (when the Legislature cannot be convened), against domestic Violence. By any definition, the yearly influx of illegal immigrants into the U.S. amounts to an invasion. Although “invasion” does not necessarily need to involve a foreign military, there have been several instances where foreign military have invaded U.S. territory while the Justice Department does nothing. There have been many instances where armed criminals have invaded our territory and committed murder and kidnapping, again with only a cursory response from the federal government. Example, instead of supplying protection to the State of Arizona when requested, and as the Constitution Demands, the Justice Department brought suit against the state for attempting to enforce the law themselves. These are just some of the illegal acts committed by the federal government against the original Constitution. When we add violations of the Bill of Rights and other Amendments, the list becomes too long to discuss in detail in a blog post. They would include violation of the First Amendment guaranteeing freedom of religion, expression and assembly; the Second Amendment guaranteeing the right of self-defense; Amendment Four protecting against illegal searches and seizures; and Amendment Five, the double-jeopardy Amendment. Last and most important is the constant and continuing violation of Amendment Ten.